Rusty Schlenk patiently waited through a couple rain delays to earn his first UMP Late Model feature win on Saturday night at Oakshade Raceway and Brian Plotts survived an early race pile up that peeled off most of the right side sheet metal from his car to win the 200-lap Enduro on a bright and sunny Sunday afternoon. A rain shower fell shortly before hot laps were to begin on Saturday night that delayed the start of the night’s racing program. Track crews worked diligently to get the track ready for racing along with the help of many of the race car drivers. Eventually the track came around and was ready for some racing action. One UMP Sportsman heat was run and just as the first UMP Late Model heat rolled out on to the track, the rain began to fall once again. A valiant effort by Oakshade track officials brought the track back from a slick mess back to a raceable condition again. Rain held off just enough for the remainder of the evening to get the entire action-packed program completed. Defending Late Model Track Champion Rusty Schlenk started on the pole of the 25-lap UMP Late Model feature with Ryan Missler alongside. Schlenk got the advantage over Missler at the drop of the green flag, but Missler hung in close behind Schlenk. Missler closed in on Schlenk as they negotiated through lapped traffic. One of the lapped cars, Cody Houston, got turned sideways right in front of Missler on lap 14. Missler had nowhere to go and plowed hard into the side of Houston bringing out the caution and ending both drivers’ nights. Matt Miller wanted to win his second consecutive feature at Oakshade Raceway and battled side by side with Schlenk for a few laps after the restart. Schlenk eventually got out front and held off Miller to win his first feature of the year. Rick Delong finished third after starting 10th in his first appearance of the season. Casey Noonan was fourth and Brandon Thirlby wound up fifth. A slew of caution flags flew in the UMP Sportsman feature event. The first of which came out for Tim Fisher who suffered a mechanical issue after starting on the outside of the front row. That forced him out of the race and resulted in a complete restart for the rest of the field. Mike Jessen moved up to where Fisher started and took advantage of as he darted out to the lead. After a couple more cautions, Tim Line appeared to be on the move. That is until he lost control in turn two and spun in front of most of the field and caused a huge pile up. B.J. Gregory found himself in second for the restart after the mess was cleaned up. Gregory pressured Jessen for a bit, but Jessen held on to win his second consecutive feature. Finishing third behind Gregory was Bruce Stuart followed by Brice Luttrell and Scot Mills. Chris Henry won his UMP Bomber heat race earlier in the night and led the first part of the UMP Bomber A Main. Henry got a bad restart after a caution period which allowed Jamie Grochowski and Terry Rushlow to get by. Henry then spun to the infield a short time later ending his good run. Grochowski led for a while until Rushlow took command after another restart. Craig Dippman made his presence known near the end of the race. After starting ninth, he worked his way up to second behind Rushlow and after racing side by side out of the final corner, Dippman was first to the checkered flag. Grochowski took third with Tony Tolles moving up eight spots to finish fourth. The feature winner two weeks ago, Jim Scout, wound up fifth. Another Dippman stole the show in the Hornet feature race. Taylor Dippman, Craig Dippman’s daughter, led the entire distance, but had to fend off some strong challenges throughout. Drew Smith and Derek Morris closed in early and raced each other hard for second, less than a car length behind Dippman. Smith fell back eventually and the battle for the lead continued all the way to the checkered flag as Morris did all he could to try to get by Dippman, but Dippman held on to win her first Hornet feature event ever. Morris and Smith settled for second and third respectively. Brandon Myers and Logan Hough rounded out the rest of the top five finishers. Jeff Foks took the lead from Brad Brehm on the third lap of the UMP Bomber B Main and later survived a close call with Mike Draper as contact was made when Foks attempted to put the 33 car of Draper a lap down. Tim McNicol closed in late on the final lap, but Foks was able to hang on to the victory. McNicol ended up second followed by Marty Bloomer, Josh Montague and Brad Brehm. Scott Barnhart led a four-car battle with Rick Dixon, Karl Spoores and Chris Dachenhaus early in the UMP Bomber C Main. Dixon and Dachenhaus worked their way to the front and battled hard all the way to the checkered flag with Dachenhaus edging out Dixon at the finish. Karl Spoores finished third followed by Brian Plotts and Jarrett Rendel. On Sunday afternoon a group of dirt oval gladiators gathered to see who could be the first to complete 200 revolutions around the Oakshade Raceway in the first Enduro race of the season. Shawn Stamm led the first few laps, but youngster Lamar Eby took command by lap 25. Eby wouldn’t be able to maintain that position after some lengthy stays in the pits. Chad Zuver was the leader by lap 50, but Brian Plotts, fresh off his top five Bomber C Main finish, took the lead by the halfway point of the race. Plotts had steadily worked his way from fifth early in the race up to lead the entire second half of the race. Zuver was a close second for a while but could not make up any ground on Plotts and had to settle for a second place finish. Mark Henderson ran in the top five most of the race and finished third followed by Rob Liaeff and Jack Osborn. The American Late Model Series returns to Oakshade Raceway on Memorial Day weekend with a $2,000 to win show on Saturday night. UMP Sportsmen, UMP Bombers and Hornets will also be back in action with gates opening at 4pm with racing at 7pm. 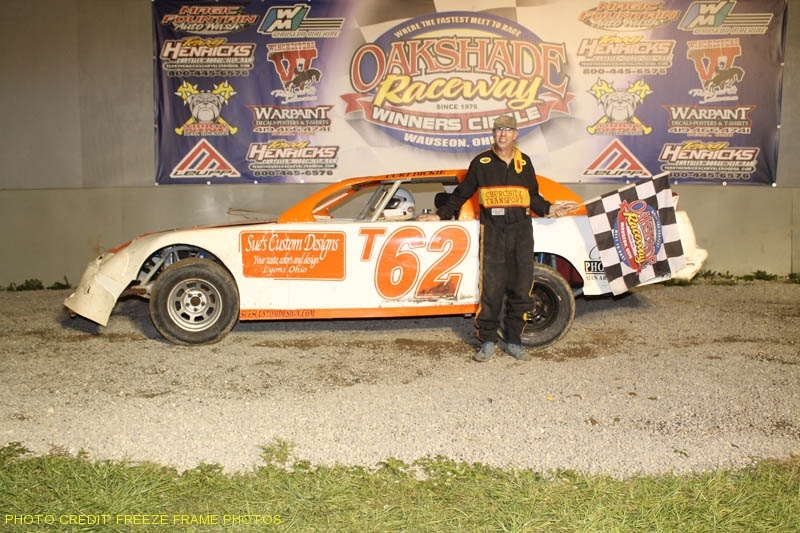 Oakshade Raceway kicked off its 35th year of racing on Saturday night with former champions making a clean sweep of all A Main feature events highlighted by 1991 Late Model track champion Matt Miller earning the first feature win of the season. Dona Marcoulier from Houghton Lake, Michigan started on the pole of the 25-lap UMP Late Model feature and led the first 11 laps over Jeff Babcock and Matt Miller. A caution for Donnie Marcoullier tightened the field on lap 11 with the double file restarts. Miller took advantage of the situation and took the lead just before Jeff Babcock and Jon Henry tangled on the backstretch while battling in the top five. Defending UMP National and Oakshade Raceway Late Model Champion Rusty Schlenk worked his way up to second on lap 14 after starting eighth, but could not reel in Miller who went on to pick up the victory. Finishing third behind Schlenk was Brian Ruhlman with Dona Marcoullier slipping back to fourth. Casey Noonan was fifth. Defending Oakshade Raceway Sportsman Champion Mike Jessen led from flag to flag of the UMP Sportsman feature event after starting on the pole. Jerry Urbanowski started on the outside of the front row, but wrecked on lap two. Brice Luttrell got by a few cars to jump up to second on the ensuing restart but Jessen powered his way out to a substantial lead. A lap seven caution tightened up the field once again and Tim Line managed to get by Luttrell for second and tried to pressure Jessen for the lead, but Jessen wouldn’t allow him to close in. Line had to settle for a second place finish ahead of Luttrell, Bruce Stuart and Joe Derbeck. Curt Lancaster took control early in the UMP Bomber A Main until a restart after a lap four caution. Tony Tolles restarted on the outside of Lancaster who chose to restart on the inside. Tolles capitalized on the opportunity and took the lead away as the green flag flew once again. Terry Rushlow brought out another yellow flag on lap seven after spinning while battling with defending champion Jim Scout for third. Scout made quick work of Lancaster and Tolles and went on to pick up what looked to be an easy victory. Tolles and Lancaster finished second and third respectively with Garry Domoe taking fourth after starting 21st. Steve Morris was fifth. Defending Hornet track champion Drew Smith led the entire distance of his feature event, but Derek Morris tried to make it a race in the closing laps. Morris was running near the front, but got turned around as the yellow flag flew for an unrelated spin and fell victim to Oakshade’s “stop on the track and you go to the tail” rule. Morris quickly worked his way back through the field but ran out of laps as he closed in on race leader Drew Smith. Smith starts off the year with a Hornet feature victory while Morris had to settle for second. Brandon Myers was third followed by Drew Greene and William Cundick. Todd Silvey grabbed the lead at the start of the UMP Bomber B Main after starting on the outside of the front row and proceeded to open up a huge lead over the rest of the field. The first caution came out on lap 9 after Kyle Light rolled to a stop. Brad Brehm was running second and dropped a drive shaft on the restart which moved Chris Dachenhaus up to second. Dachenhaus was unable to put much pressure on Silvey who went on to an impressive win. Finishing third behind Dachenhaus was Satch Crispen followed by Teri Murphy and Tony Sylvestri. Oakshade Raceway has another exciting full racing program of UMP Late Models, UMP Sportsmen, UMP Bombers and Hornets on tap for Saturday, May 14. Gates open at 4pm with racing at 7pm.